While watching a Titanic documentary, a commentator noted how many lives were cut short when it sank. Looking at a list of names one cannot appreciate who they really were. And sometimes it pops up in interesting ways. The Leamington College For Boys (Binswood Hall) in Warwickshire is being transformed into a retirement center so the local newspaper decided to list the notable pupils who graduated from it. And one of them was Rousell Davids Byles, who later became Father Thomas Byles, a Catholic priest, and was aboard Titanic when it sank. Byles was the son of a congregationalist minister who converted to Catholicism while at Oxford and taking the name Thomas. 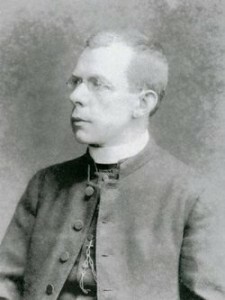 He attended Beda College in Rome and was ordained in 1902. He then was assigned to St Helen’s Parish in Chipping Ongar, Essex in 1905. His brother asked him to officiate his wedding in New York, which led him to be aboard Titanic. While aboard, he said Sunday mass for Second and Third class passengers in their respective lounges. His sermon was on the need of a spiritual lifeboat to protect in times of spiritual shipwreck. He also declined to be put aboard a lifeboat allowing others to go in his place. Father Byles is one of those little-known heroes of Titanic. Well regarded back home in his parish of St. Helen’s, his death was met with great sadness. There is a memorial to him at that church. A door in his memory was installed by his brothers, along with a photograph and a stained glass window to commemorate Father Byles. Perhaps forgotten in the Titanic story are those that went out to recover Titanic’s dead. Two cable ships out of Halifax–Mackay-Bennett and Minia–brought back most of the bodies. Four bodies were recovered in May 1912 by Montmagny, a government tender from Quebec. The last body was found by the cargo ship Algerine out of St. John’s Newfoundland. 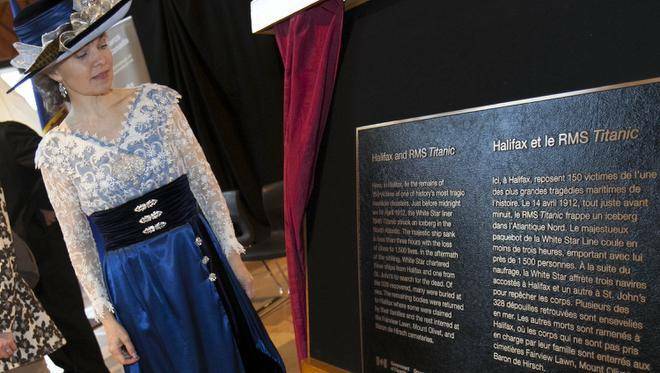 On Friday, a plaque remembering those from Halifax (called Halligonians) who went out to collect the bodies was unveiled at Maritime Museum of the Atlantic. Retrieving the bodies was important and also haunting, reports The Chronicle Herald. Pat Teasdale’s grandfather Francis Dyke was second electrician on Minia and wrote to his mother about it. “I honestly hope I shall never have to come on another expedition like this. … The Dr. and I are sleeping in the middle of 14 coffins.” Yet he was glad they could retrieve the bodies and not leave them in the water. 150 victims are buried in Halifax in Fairview Lawn, Baron de Hirsch, and Mount Olivet Cemeteries. The plaque has no permanent home yet but for now you can view it at Maritime Museum of the Atlantic in Nova Scotia, Canada. There is a minor mystery afoot concerning four rubber tablets found on Newquay beaches. Each tablet contains the word Tjipetir on them. According to This is Cornwall, that is an Indonesian rubber plantation from the early 20th century. The particular natural rubber, gutta-percha, was cargo aboard Titanic. While some speculate the rubber could be from Titanic, others are not sure. Jenny Wittamore, assistant curator at the National Maritime Museum in Falmouth,points out there have been many ships that carried this cargo. And a shipwreck in the 1920’s, according to an investigator, could be the source of these rubber tablets. There is no way to determine precisely what shipwreck the tablets came from. So the mystery continues. 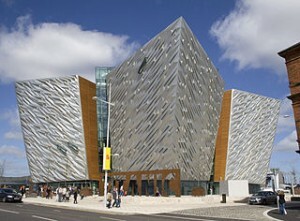 (1) Titanic Belfast exceeded all expectations for 2012 reports BBC News. More than 800,000 people from 128 countries visited Titanic Belfast in its first year. Some doubted it would succeed and would need 290,000 visitors to break even. (2) Titanic:The Artifact Exhibition is coming to Great Lakes Science Center in Cleveland in June. Advance tickets are now on sale through the web site. The exhibition runs from 1 June 2013 through 5 Jan 2014. (3) Alan Aldridge of Henry Aldridge & Son was interviewed recently by CBS News about the Hartley violin. Aldridge says that micro-analysis found evidence of salt water corrosion in the wood and metal screws on the silver plate. He also says he has no idea how much it will be worth when auctioned off. (1)The letter written by Titanic band leader Wallace Hartley to his mother was sold at auction for £93,000 (approx $141,600) reports Agencia EFE . Henry Aldridge & Son conducted the auction. The letter was sold to a private collector. (2) Colne’s Titanic Museum plans to relocate away has resulted in a petition to keep the museum reports Pendle Today . Nigel Hampson, curator, says that he would prefer to keep the museum in the hometown of Titanic bandmaster Wallace Hartley. However the current place is too small, he notes, and needs better access to those with disabilities. Hampson wants to find a solution and residents have provided suggestions. 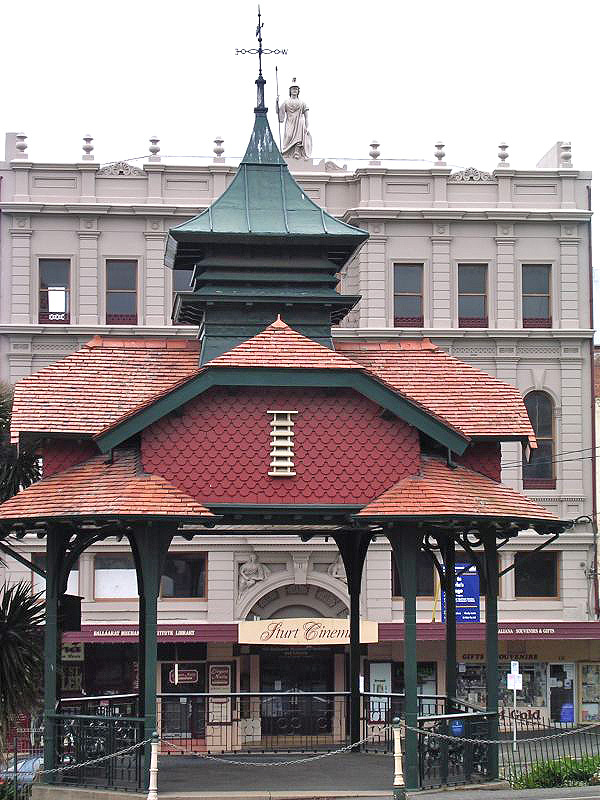 (3) Titanic musicians were remembered at Ballarat’s Titanic Musician Memorial. The memorial each year has a memorial band that plays music in its bandstand. Nearer My God To Thee is always performed at the event. Note: The article implies there is only one memorial to Titanic musicians. There is one in Southampton. 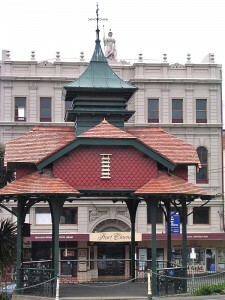 The first one was erected in 1913 next to the old library. It was destroyed during WWII by a German bombing raid. The memorial has been rebuilt and dedicated to all musicians who died aboard Titanic. You can read the Wikipedia entry here. (4) More reaction to Clive Palmer’s Titanic II is reported in Irish Examiner. Opinion is stil divided, writes Hazel Gaynor. Dave Fredericks, descendent of a Titanic survivor, is supporting a petition to block the ship. Michael Molloy of Addergoole Titanic Society is more open to it. As is Molly Brown descendent Helen Benzinger. While many in Belfast wish it were being built there and not China, the replica will be welcomed. (5) An appeal for funds to restore the headstone of Titanic chief engineer Joseph Bell is being made. His memorial at Farlam Church in Kirkhouse is deteriorating. Approximately £2,000 is needed. You can view the memorial and make a donation at josephbellengineer.wordpress.com. (7) Titanic II Update: Deltamarin has been hired to manage the design and construction of Titanic II. The 101st anniversary of Titanic sinking has come and gone. Unlike last year which had major events, this year was more subdued. That does not mean people did not hold memorials, watch Titanic movies, or visit a Titanic exhibit. It was just quiet. 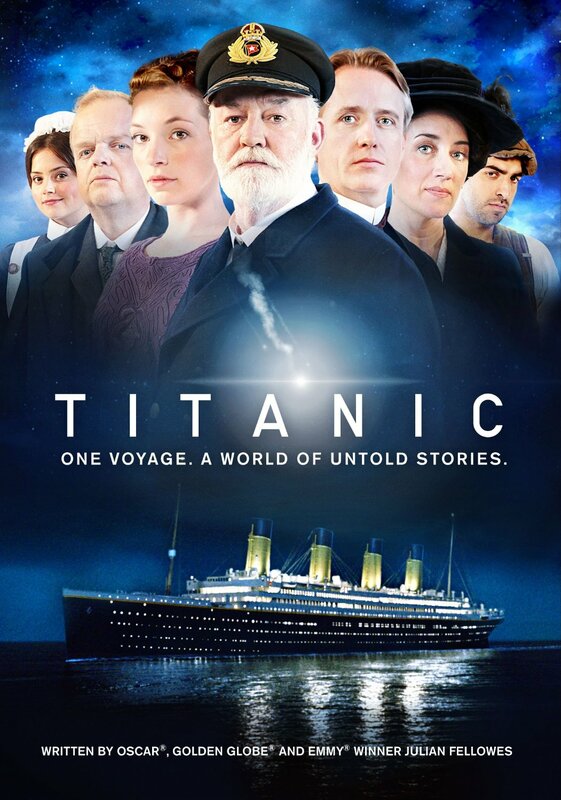 Perhaps I missed it, but none of the U.S. broadcast networks had any Titanic show. Probably it was explored on the network morning shows and that was it. A bus like this was named for Millvina Dean. Some will wonder the wisdom of naming a bus but I do not think it a bad idea. I suspect from everything I read of Millvina, she would not mind at all. Wilfred Deable Seward is probably a name few are familiar with unless you scan the list of Titanic surviving crew members. Seward was chief pantry steward for second class passengers and was in his bunk reading when Titanic hit the iceberg. Though at first told there was no problem, the 25 year old helped get passengers into lifeboat number three, and helped row it away from Titanic. His description of what he heard that night resembles what others said they heard. He continued working on ocean liners, including the Queen Mary. He retired in 1954 and resided in Ballymoney, where his daughter resided. He passed away in 1963, age 77 and was buried in the local cemetery in an unmarked grave. Many people were aware of his Titanic connection and last year it spurred a call to erect a proper memorial at his grave. And a local undertaker decided to do this. So on 12 April of this year, a service was held at his resting place with a great niece in attendance. Not forgotten anymore. Amen. 1. This is Surrey Today has an article detailing locals who survived or died on Titanic. 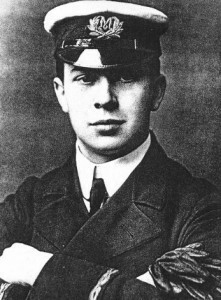 One of the more noted was Jack Phillips, who was chief wireless officer aboard Titanic. Both he and Harold Bride were the ones who sent the now famous SOS signal to all ships in the area. 2. Belfast will remember those who perished aboard Titanic (which included 28 from Belfast) with a midday ceremony. The Lord Mayor and the president of the Belfast Titanic Society will lay wreaths at Titanic Memorial on City Hall grounds. Six men whose names were not known at the time the memorial was built will be honored as well. 3. A number Titanic Artifacts are at Titanic Experience in Cobh, Ireland. Items such as a blue leather suitcase bought at Harrod’s and the personal property of Lilly Odell are permanent. The exhibition includes photographs and items on loan to the collection. 4. The Southampton SeaCity museum, which opened in 2012, is doing well reports Daily Echo. Critics had feared once Titanic centenary had faded that visitors would melt away. The project, called a white elephant by many locally, cost £15m. 143,000 visitors have passed through its doors since exceeding its target by 20,000. To keep people coming back, the museum plans to host other major national exhibitions. *Links for Republic of Ireland newspaper are not provided due to policy of requiring fees for links. There are many ways to remember people. Some are with statues, memorial plaques in parks or historical sites, music and books. Naming public transportation after people though is different but not unheard of. For instance, Caltrain (the regional commuter rail on San Francisco peninsula) names its engines after cities and politicians. Millvina Dean, the last Titanic survivor who passed away in 2009, will have a Uni-Link double decker bus run by Bluestar (no connection to Clive Palmer’s company building Titanic II) named for her. According to Daily Echo, a ceremony will take place this Sunday with her nephew, Ron Dean, and sixty members of the British Titanic Society. A commemorative plaque will be unveiled at the ceremony. Then they will take the bus to a memorial garden named in her memory in Southampton to lay a wreath. Randi Newman, secretary of the British Titanic Society says it was a nice gesture on the part of Bluestar. Apparently she had been invited to unveil a bus in her honor but sadly passed away before that could happen. 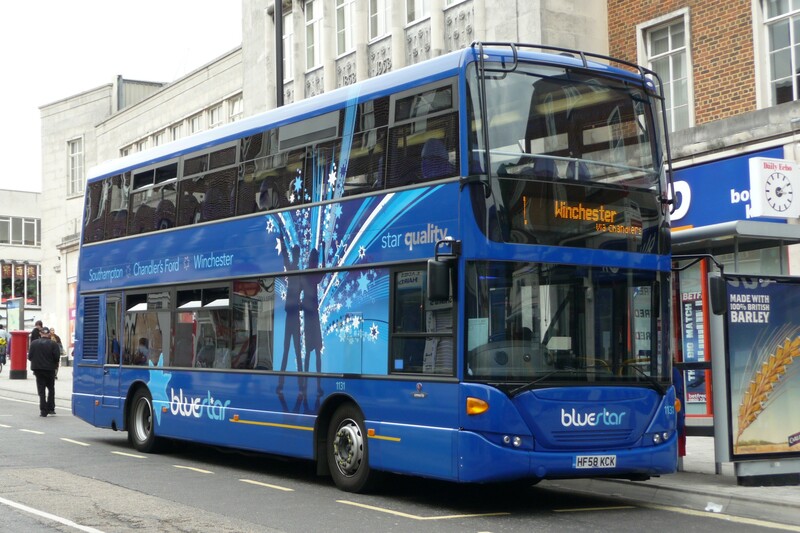 Info about Bluestar can be found here. Wikipedia has an entry here.